Camryn Nadir drives for a basket after coming up with a steal in the Kenton Ridge backcourt. Shalaya Heath scores a jump shot during the third quarter against Kenton Ridge. Kaitlyn McCrary puts up a shot over Kenton Ridge center Mikala Morris. 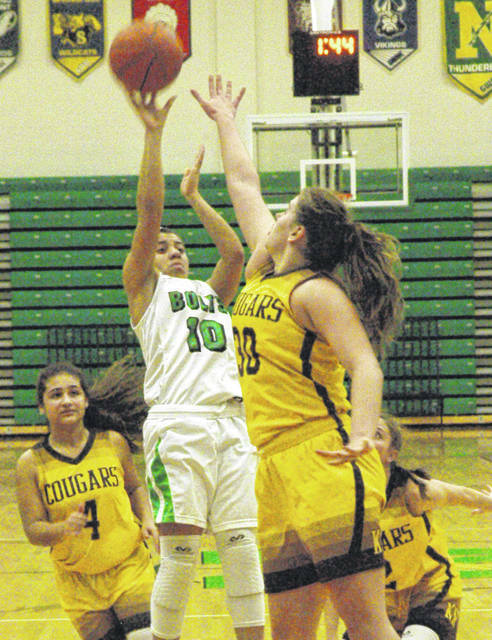 CLAYTON — Northmont battled Central Buckeye Conference power Kenton Ridge and senior Division I commit Mikala Morris to a 52-52 tie in regulation play Monday night. Morris, who stands 6-foot-2, signed with Quinnipiac University in Hamden, Connecticut. In three seasons she has 1,249 rebounds and needs 418 more to break the all-time state record of 1,690 set by Eastlake North player Kaayla Chones (1996-1999). Morris finished last season with 495 rebounds so the record is realistically within reach. In the four minute overtime period both teams had trouble putting the ball in the hoop. Mallory Armentrout, another Kenton Ridge senior, finally broke the deadlock with a layup with 2:20 left. Kirsten Wiley drew a foul from Camryn Nadir and sank one of two free throws to boost the Lady Cougars lead to 55-52. Northmont missed a shot in its next trip down the floor, managed to get the rebound, but missed another shot. Kenton Ridge controlled the rebound and Morris scored inside, drew a foul and sank the bonus shot to boost the lead to 58-52. The Lady Bolts put up another errant shot, snared the rebound but lost control of the ball. In the final minute Kenton Ridge converted three of six free throws with Morris adding another basket. She also blocked a shot. Morris finished the game with 30 points. Gabby Kline scored Northmont’s only basket in overtime with only seconds remaining to make the final 63-54 in favor of Kenton Ridge. The loss was Northmont’s third straight and Kenton Ridge’s third victory in a row. 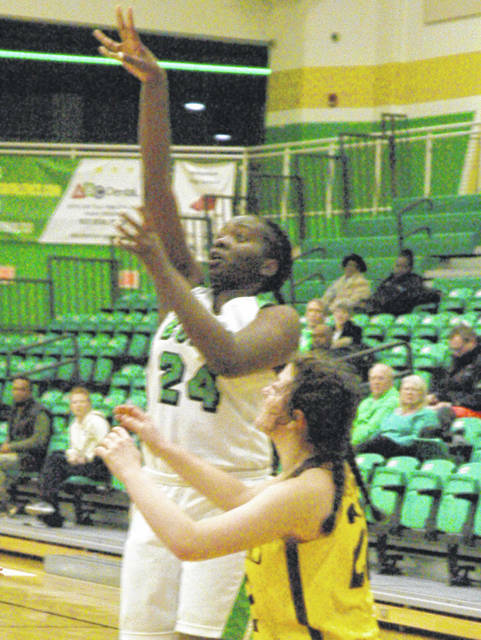 Kaitlyn McCrary led Northmont with 16 points while Shalaya Heath tossed in 13 and Makayla Cooper 11. Northmont trailed by two after the first and second quarters but rallied to lead 44-42 entering the fourth quarter. With the game tied 50-50 Kenton Ridge threw a pass the length of the court with Armentrout scoring a layup to put the Lady Cougars to 52-50. After Northmont put up a missed shot Camryn Nadir came up with the rebound underneath the hoop and scored to tie it with six seconds left. When Kenton Ridge put the ball in play a scramble for the ball ensured. Kenton Ridge called timeout while still in possession with 1.6 seconds left. Kaitlyn McCrary came up with a steal when play resumed and launched shot that glanced off the backboard at the buzzer to send the game into overtime. Kenton Ridge: Kirsten Wiley 1-3-5, Joshlynn Johnson 2-1-6, Eli Schleinitz 1-2-5, Mariah Baker 3-2-9, Mallory Armentrout 4-0-8, Mikala Morris 14-2-30. Totals: 25-10-63. 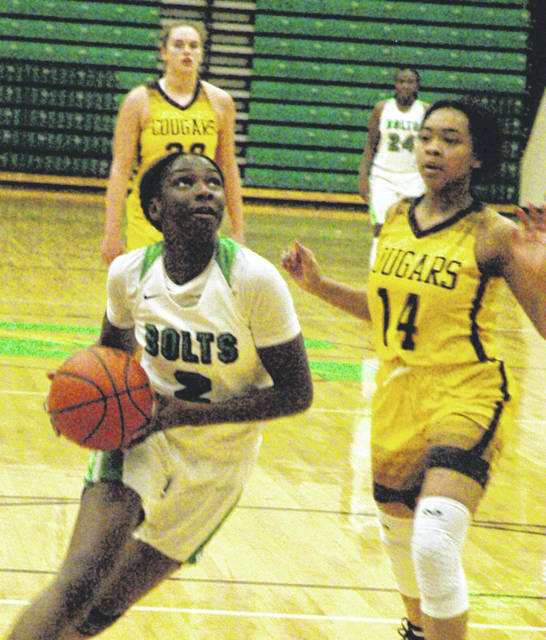 Northmont: Makayla Cooper 4-0-11, Camryn Nadir 4-0-8, Kaitlyn McCrary 6-3-16, Shalaya Heath 5-3-13, Gabby Kline 2-0-4, Jacquel Bronaugh 1-0-2. Totals: 22-6-54. Three-point goals: Kenton Ridge 3 (Johnson, Schleinitz, Baker); Northmont 4 (Cooper 3, McCrary). Records: Kenton Ridge 9-3, Northmont 6-8.